You might think it would be pretty great being Netflix. After all, the company is at the forefront of the streaming video revolution, beloved by cord-cutters and cable haters of all ages, with multiple hit shows and a sterling reputation. For some millennials, Netflix effectively is television. The company has also been a star performer for investors. Over the past year, as it has gone from success to success, Netflix’s stock (NFLX) climbed by almost 130% last year, which made it the best performing stock in the S&P 500 index. And it rose again on Wednesday after CEO Reed Hastings said it has launched in more than 130 countries. There’s just one problem with all of that success, however: Namely, everyone is wondering when the Netflix train is going to stop, or at least slow down. 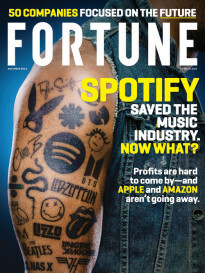 It’s not that anyone thinks the company is going to suddenly fall off a cliff, or stop being a leader in streaming video. But there’s no question that Netflix is facing some strong headwinds in the market, including increased competition, and that is likely to keep the stock under pressure despite its Wednesday boost. 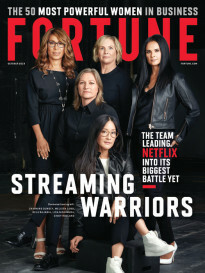 Increased costs: As TV networks like CBS and cable companies like Comcast launch their own streaming services, they are becoming less reliant on Netflix, so the company is focusing on creating its own shows. The downside is that doing this pushes Netflix’s costs up by orders of magnitude. This year alone the company said it is going to produce 10 new feature films, 30 children’s shows and 12 documentaries. That means billions of dollars in added costs. Pricing pressure: Partly as a result of its increased costs, Netflix has been raising the price of the service, and is likely to continue to do so. While some users will feel this is worth it because there is more original content, an increase in price will also probably produce a lot of “churn” in the company’s subscriber base. That increases the uncertainty about future subscriber levels. Competition: As streaming becomes more and more popular, competition for those viewers is increasing dramatically, with existing players such as Hulu and HBO being joined by Amazon—which has extremely deep pockets—and new offerings from CBS and others. While they may be inferior, they could siphon off some of the potential market for Netflix’s expansion. International growth: As CEO Hastings noted in his keynote at the Consumer Electronics Show, the company is now in over 130 countries, and that expansion is one of its big bets for the future. But Baird and other analysts have pointed out that many international markets don’t have the same kind of broadband penetration as the U.S. does, so Netflix may be less attractive to consumers there than it is at home. In a nutshell, the challenge for Netflix is to continue to replicate its past success, and to do so on many more fronts—including internationally—while competing with some significant players who may have more resources. The problem with being the king is that you have a huge target painted on your back, and expectations are high. And you can see the impact of those high expectations in some of the gyrations the stock has been through in the past six months or so. To take just one example, Netflix shares got hit hard when earnings disappointed in October, losing almost 15% of their value in a single day. And the explanation for the decline—that subscribers had difficulty because credit-card companies were switching over to cards with chips in them—was widely viewed as an entertaining fiction. When your stock has already doubled in price in less than a year, it’s natural for investors to wonder how much longer the party can continue. And Netflix is going to be feeling that pressure for some time to come.